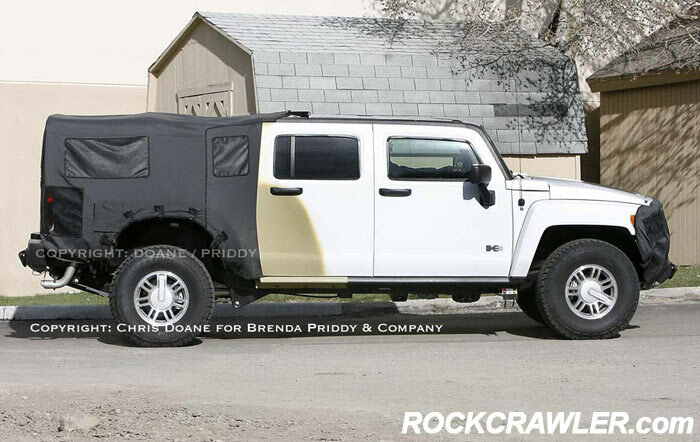 ROCKCRAWLER.com - 2009 HUMMER H3T Spied! Codenamed GMT745, the long-anticipated Hummer H3T was spotted over the weekend, sporting a crew-cab configuration. Although the original concept was a short-bed pickup with just two doors – economic decisions made the four-door H3 variant much more affordable to produce. The short-bed, which can almost be described as “cute” – will offer a cargo area of roughly 4-feet wide by 4½-feet long. 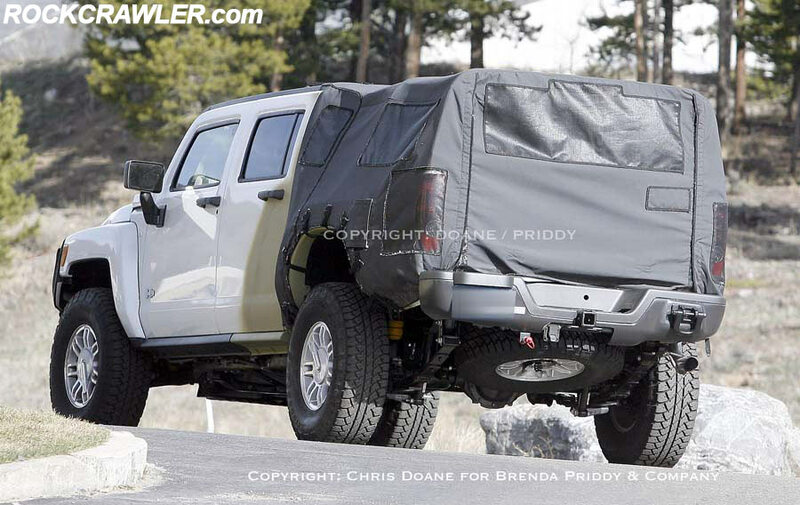 A hard tonneau cover will be available as an option, as will several choices of lockable cargo boxes. The H3T’s optional cargo boxes are expected to include a small lunchbox/toolbox with the ability to easily lift-off and take to your worksite. Other boxes are likely to include cargo boxes that the whole length of the bed, as well as one which will run the width. Engine options will include the new 295-horsepowerV8 as first shown in the H3 Alpha, as well a 242-horsepower 3.7-liter I5 powerplant. The Shreveport-built H3T will start production in August of 2008, and arrive in the third or forth quarter of 2008, as a 2009 model. Hummer plans to build about 35,000 units annually. PhotoCredits: Chris Doane for Brenda Priddy & Co.